I am no Broadway Buff but if I ever get the chance to visit New York one fine day, I'd surely include LMAO Off-Broadway on my agenda. Simply because I fancy myself as being adventurous (not in a rock-climbing backpacking kind of way though!) when it comes to trying out new attractions that seem to be a hit with the locals like Broadway comedy! 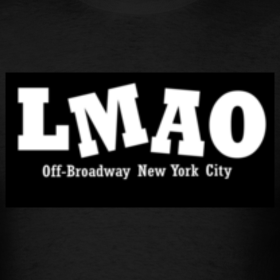 LMAO Broadway is an off-broadway's newest musical comedy extravaganza! I do like anything extravaganza and watching a Broadway comedy is something I've never tried so I am game for some laughs. Ranging from American Idol and Glee to Tiger Woods and Charlie Sheen, topics are changed daily and YOU as part of the audience will decide on the topics for every scene. The cast will then perform their comedy songs and sketches based on your choice, pretty cool right? The show is currently running at Midtown Theatre in Times Square, which has also been renovated for extra comfort and glam to accommodate its 200-capacity. Dinner + show packages are available upon request so long as you make your reservations ahead of schedule. For some laughs and giggles with the hilarious LMAO cast, please visit them today and make your bookings early. If you get to New York ahead of me, maybe you can write your personal review on the show first; give me more reason to be adventurous! LMAO tee-shirts are available too so don't forget to pick one up on your way out. I'll take two in Blue and Pink please! love the title LMAO!! lol!! =-O =-O =-O Monica Meow 1! Lama sungguh tak singgah sini. Hows the kids? Depa nakal2 tak lagi.. hehehe..